Browse: Home / Iran holds naval war games amid rising tensions with U.S.
Codenamed Velayat 95, the Iranian Navy will embark on drills involving surface vessels, submarines and naval helicopters in the coming days. Rear Admiral Habibollah Sayyari told local media the annual drills will be conducted in the Strait of Hormuz, the Gulf of Oman and the northern Indian Ocean,. Millions of barrels of oil are transported daily to Europe, the U.S. and Asia through the waterways that run along the coasts of Yemen and Iran. The U.S. Navy’s Fifth Fleet is based in the region to protects shipping lanes in the Gulf and nearby waters. Since taking office last month, President Trump has pledged to get tough with Iran, warning the Islamic Republic after its ballistic missile test on Jan. 29 that it was playing with fire and all U.S. options were still on the table. Following the missile test the U.S. president warned that “Iran has been put formally put on notice” for firing the ballistic missile, and later imposed new sanctions on Tehran. 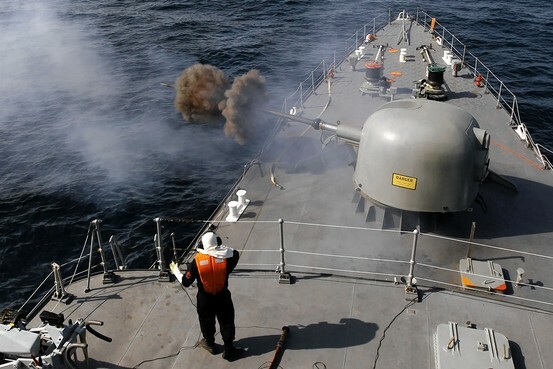 Iran remained defiant however, and along with its annual naval drills the navy announced plans to launch its most advanced warship to date. Although described by Iranian officials as a “destroyer” the Sahand will smaller than most western destroyers, weighing approximately 2,000 tonnes. Nonetheless, once fully fitted the Sahand will be equipped with advanced weapons, including the Fajr-27 naval gun and Sayyad-2 anti aircraft missiles.